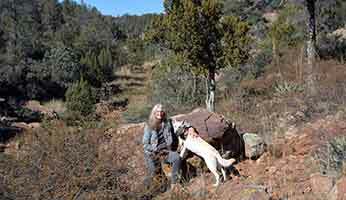 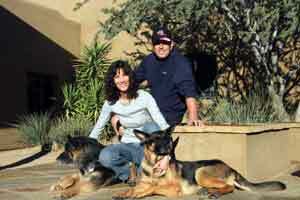 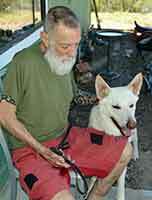 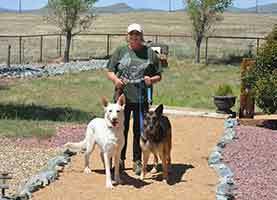 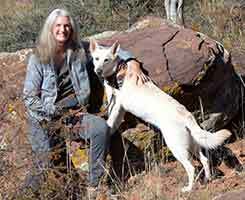 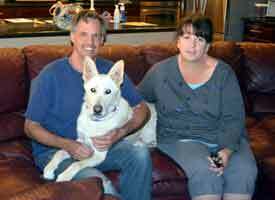 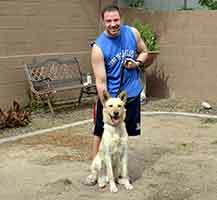 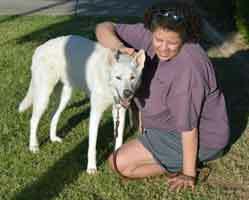 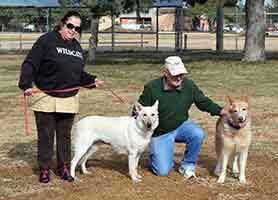 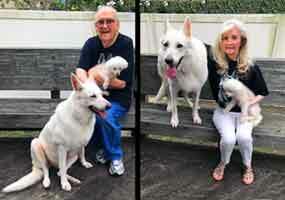 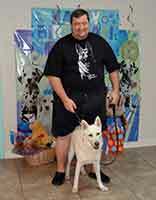 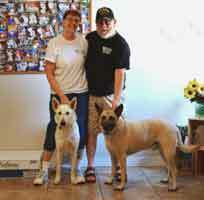 Joe knew when he found Sheeba on our website that she was the one for him and Shea ~ and he was right! 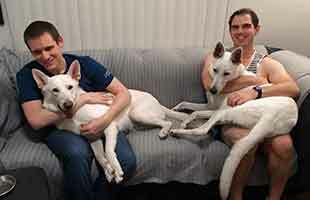 Chloe needed a busy household and she certainly got it with adopter Dan and his roomy, Alan. 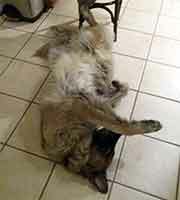 She's going to be one tired little girl. 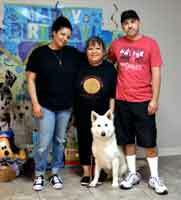 When Bodhi's family was forced to surrender him, George (a prior adopter & Navy vet) stepped right up ~ another senior for a senior! 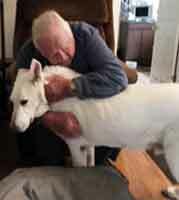 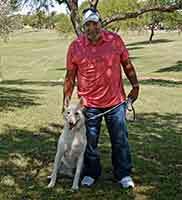 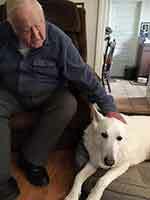 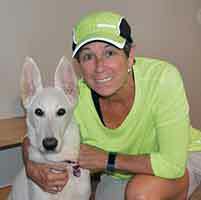 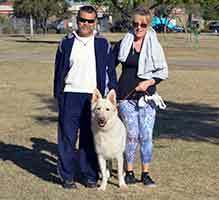 George also adopted Sam (an owner surrender and a senior) from us in 2012. 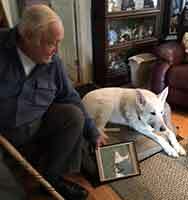 George shows Bodhi his predecessor's photo. 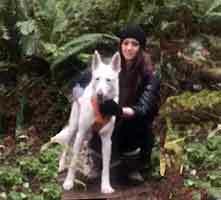 BELLA & VERY HAPPY MOM ALICE ...... 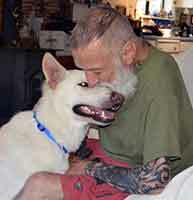 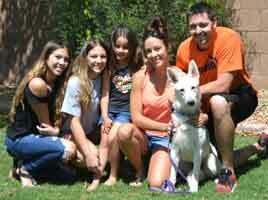 and....VERY RELAXED at "HOME"
It took Rosco five months to find the right family ~ but he sure picked a good one! 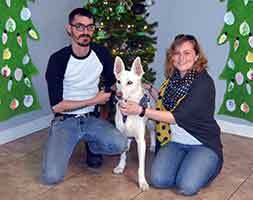 ...and Katie makes, well, four! 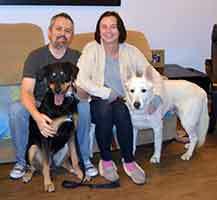 Jerry and Kathy are now two-time adopters, having adopted Sullie from us about 10 years ago! 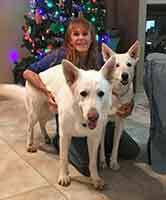 Kerry spotted Albert as soon as he hit our website ~ she and Chris signed up to foster and then adopted him as soon as possible ~ Merry Christmas to all! 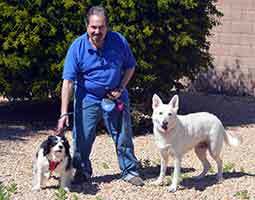 Bill and Sue took Lobo on as a foster and completely fell in love -- and the best part is, Lobo doesn't mind Bill's trumpet playing at all! 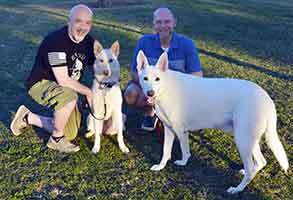 Rich and Troy fell in love the minute they met Ramona -- let the spoiling begin! 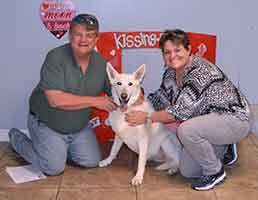 Ariell thought Breeze was her perfect match -- and Breeze agrees! 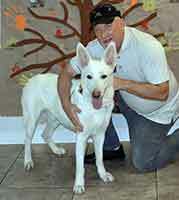 Laverne heads off to forever with new dad, Jeff ~ she's going to be one spoiled little girl! 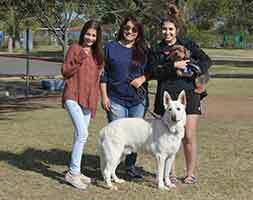 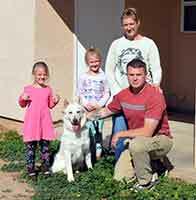 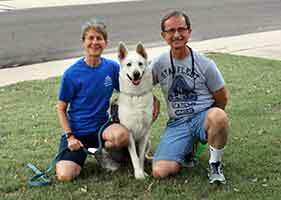 Jerry & Sandy offered to foster Blaze as soon as he arrived in town ... and they never let him go! 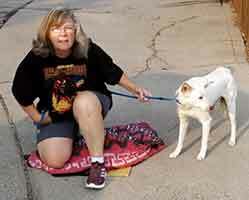 When Laverne proved to be too much for Gail and Jeff's cat, Anna applied for, and got, the job! 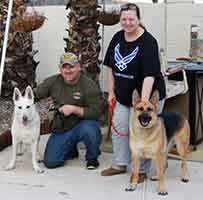 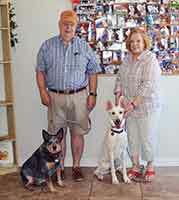 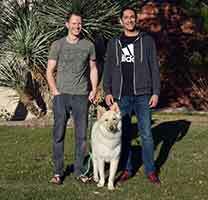 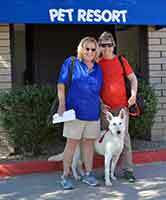 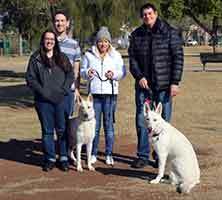 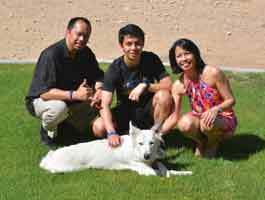 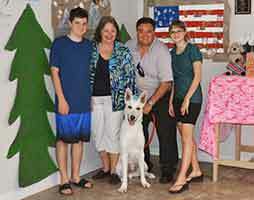 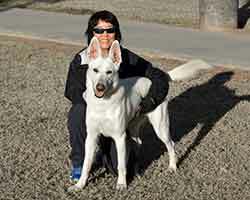 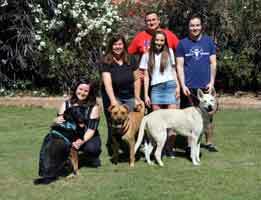 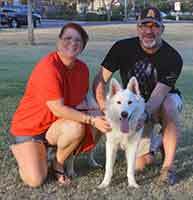 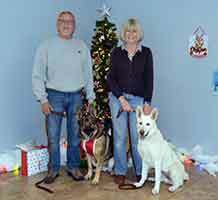 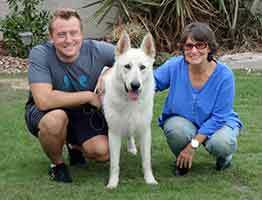 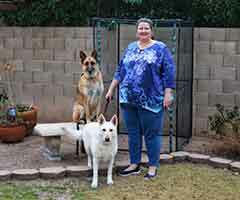 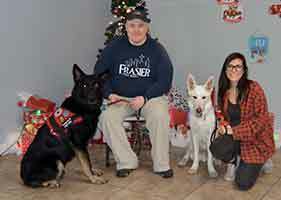 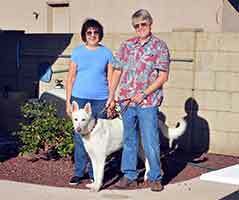 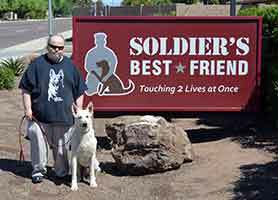 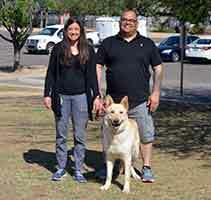 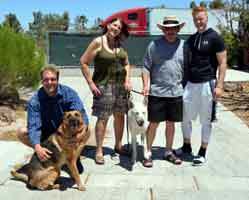 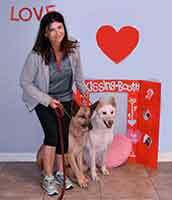 Halo is going to have a wonderful time with adopter Chris (at left) and the gang at Reindl Powerboats in VEGAS, BABY! 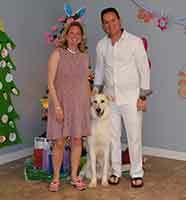 Venus is going to be one spoiled little girl if Liz and her family have anything to say about it!